This is an animated gif of Homer Simpson laughing. In this particular scene (during the episode "Dog of Death"), Homer imagines what he would do if he won the lottery. i.e. becoming a person that is made out of 14 karat gold. This is an animated gif of a guy with sunglasses setting down a folded chair. After sitting on it, he looks across at the woman to his right and says "dis gon be good" / "this gonna be good". This can be used as a reaction gif whenever drama is unfolding. 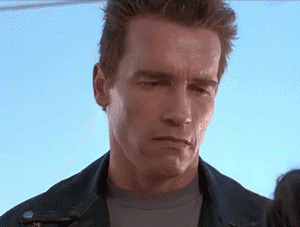 This is an animated gif of the Terminator smiling. The awkward smile makes this gif hilarious. The Terminator was played by Arnold Schwarzenegger. This is from the second in the series (1991, believe it or not). This is an animated reaction gif of a black woman clapping and raising her hands as if to say "Praise the Lord". I'm guessing that this is from one of those Christian TV shows. Great gif to use whenever you want to express your delight at something that has just happened. This is an animated gif of an excited Ron Swanson giggling. Swanson is a character in the NBC's TV show Parks and Recreation. This is an animated gif of Jack Nicholson hitting a door with a hatchet. This is from the movie The Shining (1980), where Nicholson played a psychotic character called Jack Torrance. 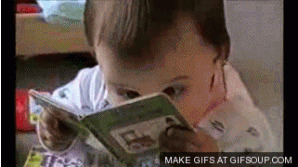 This is an animated gif of a baby girl reading a book. The thing that makes this gif so funny is how frantic and excited she looks. Also, the fact that she probably can't read. This is an animated gif of Duance dancing on the TV show "Dance Show". Duane became viral when gifs and Youtube videos of him dancing resurfaced on the Internet. This is an animated gif of actor / comedian Jim Carrey running out of a courtroom. This scene is from the movie Liar Liar (1997), where Carrey played the character Fletcher Reede, a lawyer that is cursed with the inability to lie. 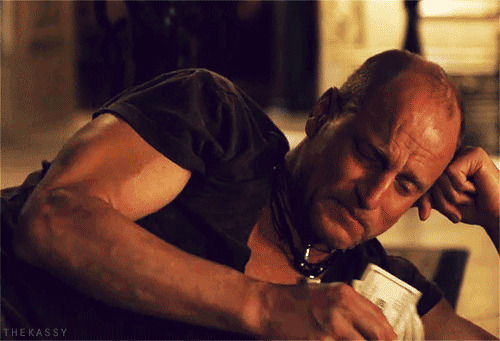 This is an animated gif of American actor Woody Harrelson wiping his tears with money / dollar bills as he is crying. If my memory serves me correctly, this is from the movie Zombieland (2009), where Harrelson played a character called Tallahassee. This is an animated gif of a guy walking along with his head down. A perfect reaction gif to use whenever you feel deflated or sorry for yourself. Not sure what this is from, but it kind of looks like Michael Cera (it's a bit late, so forgive me if I'm wrong / seeing things). This is an animated gif of D'angelo Barksdale shaking his head in disapproval. Barksdale is a character from the hit TV show The Wire. This scene is from Series 1. This is an animated gif of Carlton Banks dancing. Carlton is a character from the show: The Fresh Prince of Bel Air, in which he was Will Smith's nerdy cousin. This is an animated gif of a baby (young boy, I think) pretending to fall asleep. The smile on his face afterwards is absolutely priceless. This is an animated gif of Star Trek character Captain Picard giving an awkward / hesitant wave. 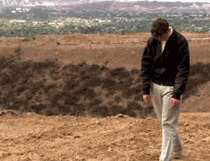 Great reaction gif for being caught in an awkward situation. This is animated gif of the NASA celebration after the Mars Rover had successfully landed. This can be used as a reaction gif for whenever you're happy for the achievements of somebody else. Example: Seeing your friend score with a girl. This is an animated gif of a young boy saying "oh boy!". Not exactly sure what this scene is from, so if you know, please post a comment below. All I know is that the gif is from an old black and white movie. This is an animated gif of a girl dancing with her Pajama pants pulled up onto her shoulders. This is the kind of stuff that people do when they're on their own and nobody is watching! This is an animated gif of a dapper black dude dancing Charleston style. As far as I know, this is an original jazz dancer from the 1930s. Edit: Apparently, this is one of the duo: Al Minns & Leon James!